Well, the day has finally come and passed, and Monster Hunter 3 Ultimate is officially available to hunters across the nation. 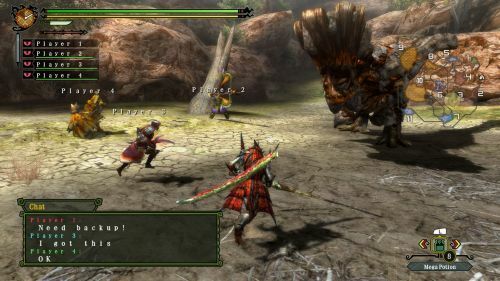 While you wait for our review, you might be interested in the tangible differences that set this version of Monster Hunter apart from Monster Hunter Tri on the WIi. Luckily, the folks over at Capcom-Unity have you covered. A few days ago a Capcom employee by the name of "Yuri" detailed some of the specifics of Monster Hunter 3 Ultimate. ... and a brand new final boss! In addition to the monsters, there is a new AI companion. He is a shakalaka named Kayamba. Of course, Cha-Cha will be present as well. They are both customizable with their abilities, dances, and 18 masks. For more specifics, there are now 211 new quests, bringing the grand total to 339 quests (not including DLC ones). For equipment, there are 2042 new pieces present in this game, with a grand total of 3061 pieces. Finally, there are three new areas: The Tower, Misty Peaks, and the Tainted Sea. This was a tangible list of additions to give you an idea about the new content in Monster Hunter 3 Ultimate. The game will feature up to four player local play on the 3DS, and up to four player local and online play for the Wii U. For a more detailed analysis of the game, stay tuned for our full review, which will arrive soon. Page created in 0.2315 seconds.